Oxidation takes place when heat transfer fluid at high temperatures comes in contact with air. It can be termed as one of the most common ways that heat transfer fluid can experience degradation. The heat transfer systems used in process industries are an integral part of the plants. Proper maintenance and operation of the heat transfer systems and fluids will extend the useful life of the fluids, keep the plants running efficiently and avoid premature oxidation of the thermal fluid. It is common knowledge that heat transfer fluid experiences oxidation at different temperatures, however, the most basic type of petroleum fluids usually experience oxidation at temperatures above 200°F (93°C). Also, it is a generally accepted fact that for every approximate 60°F(15°C) increase in temperature above the base temperature level of 200°F(93°C), the rate of oxidation doubles. How do you prevent oxidation? If the processing system has an external reservoir, and fluid is running through it as part of the system flow, consider plumbing it such that the reservoir does not remain part of the circulation loop. If the plant does not have an external fluid reservoir or an external expansion tank, it is best to add one as a thermal buffer at any of the high points of the system, placing it near the point of air contact. This will help to reduce oxidation. If the reservoir is not part of the circulation loop, but if it is still too hot, moving it further away from the primary system or adding a nitrogen blanket to prevent the fluid from contacting atmospheric air can help to avoid oxidation. 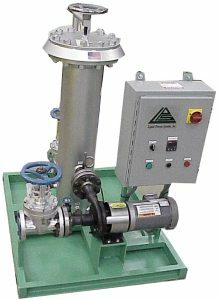 Stand-alone thermal fluid filtration system with its own pump and motor to provide differential pressure across filter housing can be installed anywhere along the hot oil system loop. Another point to note is not every fluid is affected in the same way by oxidation. Aromatic-based synthetic fluids are found to be more resistant to thermal degradation than natural mineral oils. The suitable operation temperature of mineral oil thermal fluid is limited to 282 to 302°C (540 to 575°F) whereas synthetic aromatic fluids can be operated up to 750°F (400°C) – allowing synthetics to be used at higher temperatures and for longer durations. It is important to remember that oxidation of heat transfer system fluid leads to its degradation. Oxidized fluid will further degrade and compromise the heat transfer efficiency and reduce its service life. Recognizing that oxidation can cause a major breakdown in process heating systems, Liquid Process Systems offers the highest quality of heat transfer fluid filtration to help combat and limit the effects of oxidation. Our industrial hot oil filtration system contributes to increasing the useful life of the heat transfer fluid and maintain the efficiency of the process heating system to transfer heat to the heat users in all types of manufacturing processes.